I cannot tell you how many cheesecakes and it's variation I have been baking during my baking life. 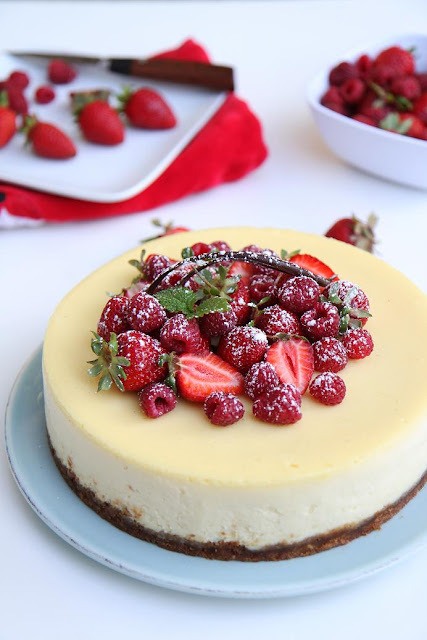 I don't think I have one go-to recipe for cheesecake as all of them seem to be really good (it's hard to go wrong with cheesecake). If I have to pick one, it will probably the mascarpone cheesecake, but it is also neck to neck with Alain Ducasse's cheesecake. 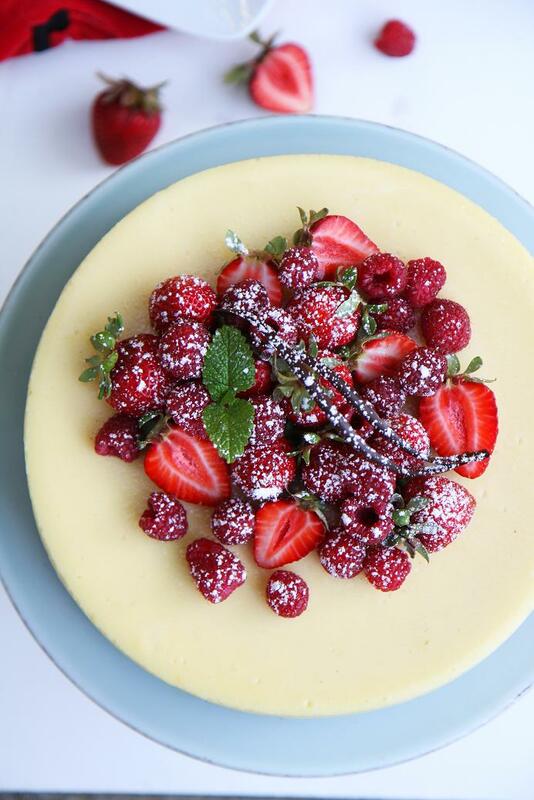 Needless to say, I am still very open in trying out great-looking cheesecake recipe when I see one, especially one that's from Pierre Herme's book, Pierre Herme Pastries. It started with me and M, playing Wii together and racing Mario Kart. We both love the game and we play till very late at night. It got boring after some time and we decided to place a bet to make it a little more interesting, and this is one of the outcome. The bet was, if he won, I get to make him cheesecake, and if I won, I get to have his coke or something (I don't remember, there were too many bets and I finally gave up cuz he won too many). M LOVES cheesecakes and I LOVE making cheesecakes. Despite having baked so many cakes and cooking so many things, I rarely make anything for him. No particular reason other than that we don't have our own kitchen and he is quite a picky eater. Well, this would be the first cheesecake I will ever baked for him. I am fine with it though, I was glad to make it as I had 3lbs of cream cheese sitting in the fridge, and we are on a quest to put on some pounds on M. This seems perfect. Now, onto what kind of cheesecake I will make. I have been wanting to try Pierre Herme's cheesecake recipe from the book I mentioned, it looked great, although I was having some doubts on a few things. The book does have bad reviews due to many reasons. I just couldn't agree with that until I tried it myself. But what if it doesn't come out good? What if I mess up the first cheesecake I will ever baked for him, and all that, but I decided to go with it, come on, it's Pierre Herme. It started with a base of pate sucree, which I make often, no worries. I baked it, grind it into powder, and incorporate the softened butter (the first mistake). The recipe calls for too much butter and be baked in a cake ring, but I followed it anyway. The result is a disaster for me. There was too much butter that it bubbled up like crazy in the oven and it oozed out the bottom of the cake ring. I ended up throwing it away and made a graham cracker and almond crust to save the day. The filling is pretty standard, what I doubted was the baking time (second mistake). I swore on waterbath method whenever I bake cheesecake, whether or not the recipe calls for it, especially if it is baked on a temperature of 300F or more. 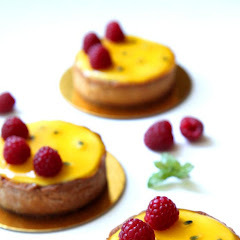 Pierre's recipe doesn't use waterbath, instead he bakes it in a very low temperature instead, which reminds me of Alain Ducasse's cheesecake (which I should say that it turned out great!). However, Pierre specified to bake it for 1.5-1hr 45minutes, which seemed impossible as I made Ducasse's recipe before and it called for 3hrs of baking for less amount of filling. By the end of the 1hr and 45minutes, the cheesecake was mostly runny still, as expected. I baked it for 2.5hrs total and it seemed to be decently set, especially after refrigerating it for 24hrs. I topped the cheesecake with sweet organic strawberries and raspberries (M loves the combination of cheesecake and strawberry). The inside of the cheesecake is still a bit soft, but not runny after being refrigerated for 24hrs. But it seemed to be perfect after 2 days of refrigeration though, it was creamy and soft. I also made a simple chocolate sauce to go with the cheesecake for the pregnant sister in law (not photographed), but you can serve it with any kind of sauce you like. M loves the cheesecake (hurray! ), and I shared it with a few friends too and they gave me great feedback. So this will stay for sure, I would just suggest to increase the baking time. 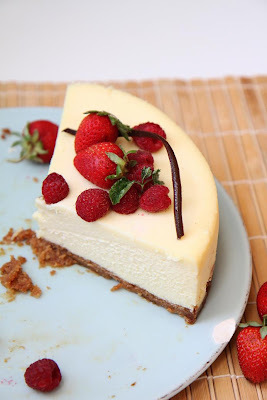 There will be a couple more of cheesecake posts coming up in the near future, stay tuned! Mix the cream cheese and sugar and beat until smooth. Pour the cream cheese filling onto the cooled cheesecake base in the ring on the baking sheet. Place in the oven and bake for 1 1/2 to 1 3/4 hours (I baked mine for 2.5hours) until the edges are set and the middle is a little wobbly. 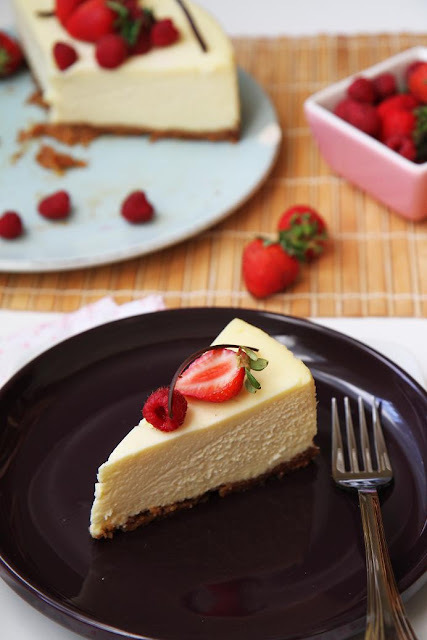 Remove the cheesecake from the oven, set aside to cool, then refrigerate. Looks sooo good! Did you bake the cheesecake at 300 F for 2.5 hours in a water bath or non-water bath?? Thanks! Your cheesecake looks gorgeous, thank you for the recipe and your beautiful pictures ! That looks amaaaazing. I love american cheesecakes. The european omes are very different. Thats why i am quite surprised about Pierre Herme publishing this recipe. The pictures are gorgeous and the cake sure tastes heavenly. 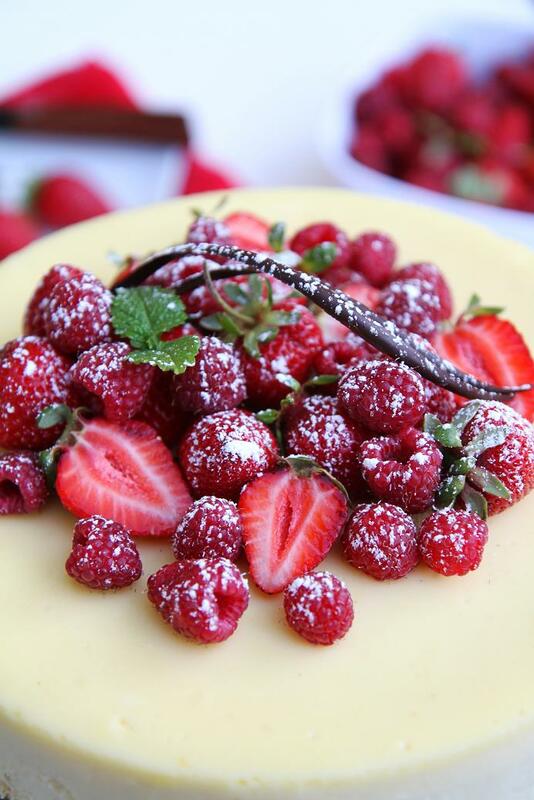 A magnificent cheesecake. Stunning pictures too! 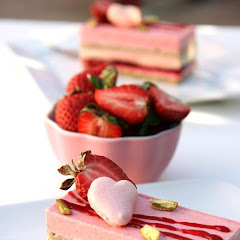 Love cheesecake, and yours looks delicious. I was wondering, what did you do to remove the whole cheesecake from the pan? Susy: I baked the cheesecake in a cake ring. So I just warmed up the sides with blow torch for a little bit then lifted up, just like removing mousse cake from the ring. Did you find the recipe hard to follow? Did you cook your cheesecake in a water bath or just by itself in the springform ? I made this and you're entirely right about the book's timings. I made a slightly smaller but deeper cake (22x4.5cm) and it took 2h50m at 90C (195F). As for the base, it's a bit of a puzzle. The amount of butter makes quite a wet slurry which needs to firm up in the fridge before baking. Once in the oven, the base does bubble up and leak a lot. Like you, I thought this must be a mistake. However, once cooled a little and then baked with the filling, the final result was an incredibly buttery biscuit base. 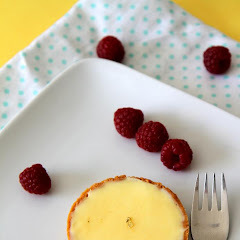 All in all, a very nice cheesecake with a light, creamy filling to go with that buttery biscuit. I wanted to know if u wrapped your cheesecake ring in foil before pressing the pâté sucre onto it, or if u just placed it onto a metal tray directly. I'd love to try this recipe! Thanks to correct all the mistakes and share them with us. I have Alain Ducasse cooking book and noticed a lot of mistakes that mess up the recipes and I am wondering why it could happen since the book is usually reviewed! Anyway Thanks for your cheesecake recipe I look forward to test it! Cheers! Wonderful, i loves this recipe. 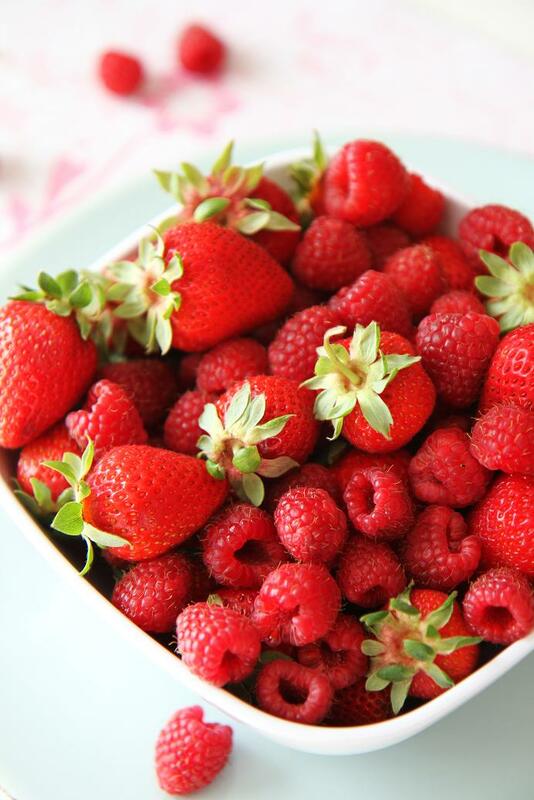 Strawberry! 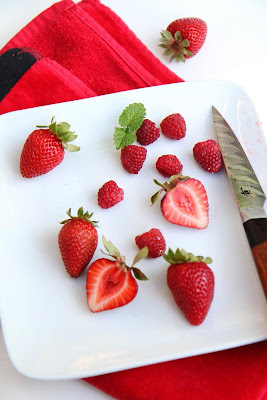 I just found a local business in Saskatoon, Saskatchewan using the photo from this recipe blog post to advertise their business. lol... Their own baking is horrifying looking. Just thought you'd like to know they're passing off your photo as their own. The batter was great, but I think I dried out the cake. Do you keep the cake in the oven a couple of hours after it's done baking or do you take it out immediately?